When a person hires a video animation studio, they ultimately expect that the company will value their time and money and will hand them over a quality product in the end. If any company fails to satisfy the needs and outlooks of their clients, then it ultimately results in creating a bad name for the organization. No one will see whose mistake was it in the backend, but critics will only badmouth about the name of the organization. In order to avoid any unfortunate events to occur and any bad reputation to be created for the video animation studio, the owners or executives focus on hiring the best and most qualified animators to work with them and provide quality outcomes for their esteemed clients. 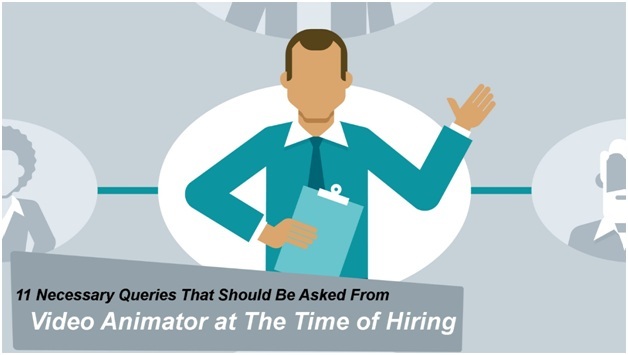 It is evidently not an easy task to know whether the person a company is interviewing is a professional or not, which is why it is essential to ask the right questions to make sure that the most appropriate person has been hired to carry out the job of creating animated videos for clients. Query # 1: How Much Knowledge You Possess Related to the Video Animation? A professional animator must have all the right knowledge about the techniques and latest methods to create the video animation. Also, they have a vast understanding of the work and how to create different types of video animations. Query # 2: Which Form of Video Animation Are You Expert In Creation? Some people know how to create spectacular motion graphics, whereas some have the expertise in explainer video production, the interviewer must ensure that the person is able to create the animated video in the format that is needed by the company. Query # 3: How Much Professional Experience Do You Have? It is important to ask bluntly whether they are experienced or the beginner if the video animation studio is looking to hire someone for a job. If the studio wants to appoint someone for an internship, then it is fine if the person does not have enough experience. Query # 4: Have You Ever Worked for Professional Video Animation Studio or Have You Been Only Providing Freelance Video Animation Services? If the person does not have any involvement of working in the office, it is more likely to happen that they would not be comfortable working in the team, and would prefer to work individually, which is not acceptable at the professional level. Query # 5: How Was Working With the Previous Client/Organization Worked Out? It must be in the knowledge of the video animation studio that how does the person like to work, and what is their ethical behavior with the clients and other team members. All of this could be known only when it will be in front that how their previous experience went with their clients or other group mates. Query # 6: How Do You Differentiate Between Different Types of Video Animations? A professional video animator must be able to tell the difference among different video animations, as the diversity is very clear and can be spotted easily. If they fail to tell the variance, then they are most likely to be lying about their great knowledge and experience in the video animation field. Query # 7: Do You Prepare the Script on Your Own? Some animators are talented enough that they create the script for the video on their own. It should be in the company’s knowledge of how skillful person they are dealing with. Query # 8: Are You Comfortable in Working Alone on the Projects or Do You Prefer to Work in Team? It is essential that the person should be able to feel contented with working in a team to maintain a positive environment of the organization. Also. Working collaboratively helps solve many issues that could arise during the project. Query # 9: How Do You Face Challenges That Comes While Creating an Animated Video? It is important to learn the way the animator deals with the challenges so that their attitude towards work can be judged easily. Query # 10: What Is the Most Ruthless Difficulty That You Have Faced So Far While Working in the Animation Industry & How Did You Solve It? It is significant to know what level of problems the animator has faced in the past and how did they bring solutions to that problem, so that one can expect the same professionalism from them in the future. Query # 11: How Much Time Does It Take Usually for You to Complete a Project? The speed of the animator also matters a lot, as there could be more than one project on the plate and they might be needed to take care of the short deadlines, for which it is important to know how much time they usually take to accomplish a project.